The Louisiana state flag shows the state seal featuring a heraldic pelican feeding three of its chicks by tearing at its own breast in a nest. The state motto "Union, Justice and Confidence" is on a golden scroll beneath the pelican’s nest; all on a field of blue. We at Tuff Flags offer premium quality Made in USA flags at the best rates. Choose from different material choices, sizes and mounting options. 100% made in USA, these flags are made to the highest standards and carry 6 months guarantee on construction. Our industrial grade flags are designed to last long and look great for a very long time and are perfect options to show your state pride.Shop from our complete line of Louisiana Flags right away and avail the best prices, quick shipping and much more! 100% customer satisfaction guaranteed! Tuff Flags offers Louisiana flags in both indoor and outdoor models. The low weight nylon flags are great choices for both indoors and outdoors. Durable and attractive, these flags feature UV resistant Dupont inks, which will retain its colorfastness and dazzle for a very long time. Finished with grommets and heading, these flags depict the intricate state emblem in the finest details. 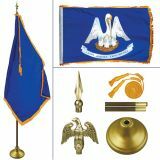 Our indoor nylon flags are available in both gold fringed and plain models. We also have the indoor flag kit in Oakwood for those who need a complete flag display kit that contains everything right from the flag to the tassels and ornament. If you are looking for a heavy duty outdoor flags in high wind areas, we recommend the tough fabric of 2-ply polyester. 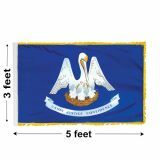 Browse our selection of Louisiana Flags to choose a model that matches your flag presentation needs. Not sure which flag will be the best choice for you?Call us at our toll free number (888) 287-3524 or email us at customercare@tuffflags.com.